“Digital disruption as well as changed business models are reshaping both the workforce and business. The new technologies … are in fact motivating forces creating the businesses of the future. These processes are creating exciting opportunities for agile and responsive businesses.” Bernard Salt, partner at KPMG. When most people think about Virtual and Augmented Reality (VR and AR), they think about video games, but recently there has been a shift towards the use of VR and AR in SMEs. Early applications can be found in retail, real estate and virtual tourism industries. So what are VR and AR? Virtual reality essentially replaces the world around you with a computer-generated environment. Augmented Reality interacts with the environment around you, blending reality with the digital sphere. The most common example of AR is Pokémon Go, which uses your phone camera to represent reality, and overlays Pokémon or Pokéstops. Microsoft is hoping that development of a product called HoloLens will lead the development of AR in the business environment. These are self-contained glasses that have computer within them. Users give instructions via hand or head movements and voice commands. The possibilities are endless. VR and AR could transform training, architecture, education, group work or collaboration, or simply to assist in the assembling of furniture or larger equipment by displaying the instructions in your line of view to prevent searching and scrolling through documentation. Watch for updates as they happen, and find out how you can incorporate this upcoming trend into your business. In 2015, video viewing comprised of 70% of online traffic. This is expected to grow, reaching 82% in 2020 (Cisco). Included in this figure is video chat, conferencing, live streaming, entertainment, education, security and marketing services. AVC involves video streaming and collaboration, and is a tool that SMEs can utilise. Educational institutions are already embracing AVC to stream of lectures online. However, the use of AVC is not limited to the education industry. For many businesses, AVC will be a tool that helps to improve efficiency, through the use of chat, audio, and collaboration between teams and industries. Other kinds of video are also on the way in. Namely, the use of 360 degree video. These offer the unique opportunity to put a viewer in the middle of the action, whether it be a music concert, art gallery tour, real estate viewing, or a new shop opening. This technology is now supported by Facebook, allowing you to reach more of your followers with this tool. When making business decisions, SMEs need to gather relevant information. Making decisions based on limited or dated data, leads to incorrect choices. The expansion of tech now means that SMEs can have useable information at their fingertips to help make these decisions. The use of data is limitless. Retailers can track customer behavior and market opportunities; establish baselines performance and ROI expectations; social media data to determine the more effective marketing strategy. What information do you have access to through your existing or developing software, and what information do you require to make informed decisions? Cloud computing gives SMEs flexibility. Theoretically, cloud computing allows users to store data and access information and applications online. However, the capabilities is unleashes go beyond the simple day-to-day functioning of a business. The added flexibility allows companies to adjust as they need, allowing for expansion where necessary and access to information from any location with internet access. Companies that are cross-location can have access to the information produced by each arm of the company, creating holistic systems that allow for effective communication and collaboration between teams. Fintech (financial-technology) refers to the range of applications and business models that have evolved as a result of digitalisation of financial processes. An Australian example of Fintech is the NFP Stone & Chalk group, which coordinates and funds start-up businesses delivering new models in payment systems. However, not all SMEs impacted by Fintech are the ones producing it. Fintech has the capacity to reshape financial transactions at the consumer and business level. Diversification of payment options doesn’t stop here. 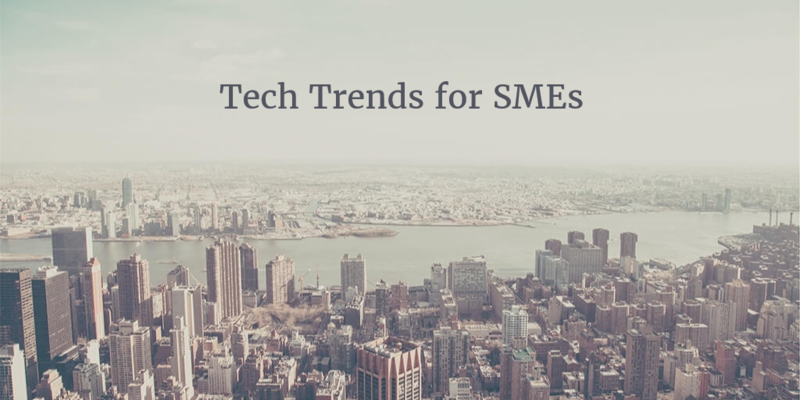 SMEs can use PayPass, PayPal, methods such as those used by Uber where money is automatically deducted from a nominated account, and the use of phones to pay using a banking apps. Stay up to date with E-payments as they happen and you wont be surprised when things change in the future.